Many of today’s physicians were not taught leadership skills in medical school. 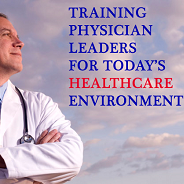 This unique and customized physician leadership training fills that missing piece. Physicians equipped with leadership skills can effectively manage and lead today’s healthcare changes and challenges. The key drivers of quality patient outcomes, satisfaction and hospital profitability are physician and staff behavior. What separates today’s successful hospitals is the cooperation and cohesion between physicians, hospital administrators and staff.